1931. In the hot, dry heat of a goldfields summer Andy, Jane and Rene Duncan returned to the Stewart family home in Beaufort. The 100-mile post marked the edge of Beaufort township. It also marked the middle of the Stewart’s triangular strip of land that stretched from the town limits along the Ararat Road into Eurambeen parish. The Stewart house fronted the highway at the Beaufort end of the triangle. Stewart’s land triangle. Eurambeen Parish map. VPRS 16171. Public Records Office Victoria. Did it occur to Andy that his circumstances echoed his father’s, all those years ago in Scotland? John Duncan had married Elizabeth Stewart and they had lived with Elizabeth’s grandmother on “Stewart’s Land” in Newton-on-Ayr. It was where Andy had been born. Now 50 years later and on the other side of the world, Andy was once again on Stewart’s land. Andy quickly became one of the Stewart family fold. Sadly one of his first duties was to be pall-bearer at the funeral of Jane’s niece, Madge Loo, in February 1932. Madge died at the age of 21. She had been delicate from childhood and death was due to heart trouble, reported the Riponshire Advocate. 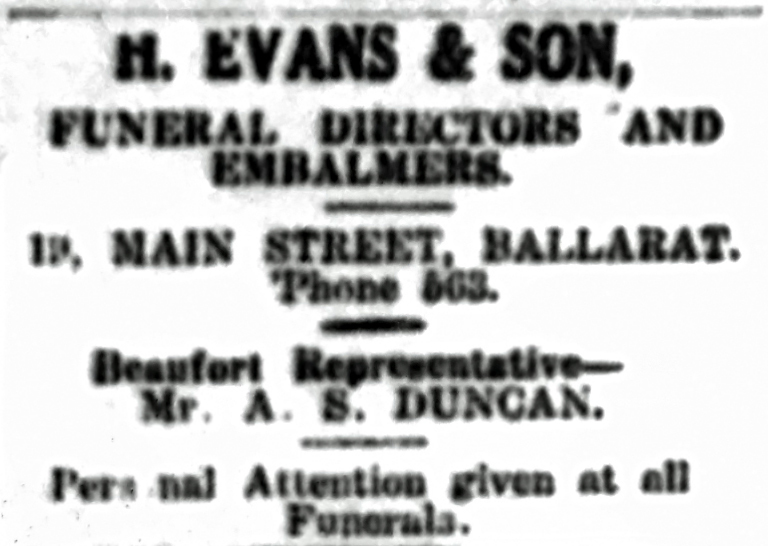 Madge’s funeral was carried out by H. Evans & Son of Ballarat. 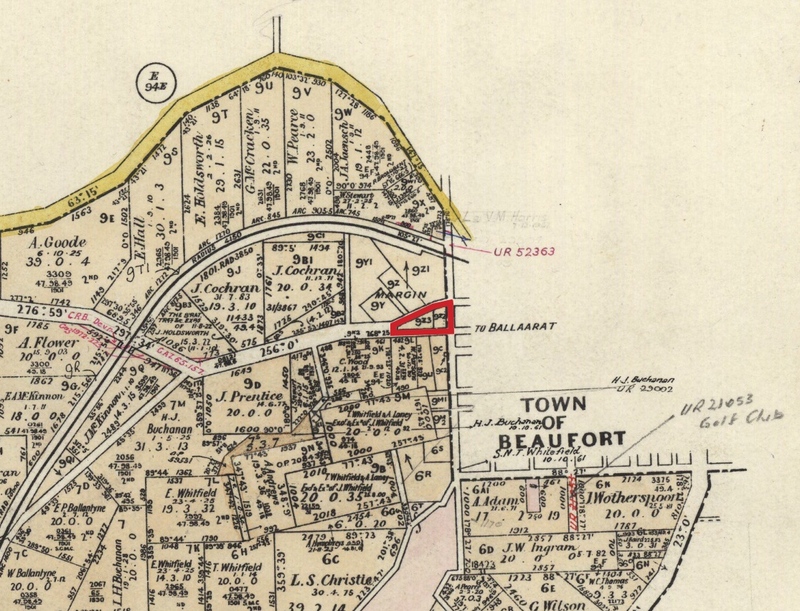 By April 1932 Andy had become the funeral director’s Beaufort representative. Andy’s health was starting to fail. When the shrapnel pieces in his back moved he would take to bed for days. He slept separately from Jane in his own room, which suggests that while the shrapnel tormented him physically, he endured mental distress as well. Mental trauma was often accompanied by sleeplessness and dreams which could arouse the household … In some families, the nocturnal anguish of returned soldiers was such that couples chose to sleep in separate beds. Andy was hospitalised at the end of 1932. The newspaper reported his return to Beaufort in February 1933 after several months in the Caulfield Repatriation Hospital. Andy looked for work less physically demanding than the sexton’s position he had left in Amherst, but his clerical skills were not in high demand. In a town like Beaufort, you had to wait for someone to retire before those kind of jobs opened up. 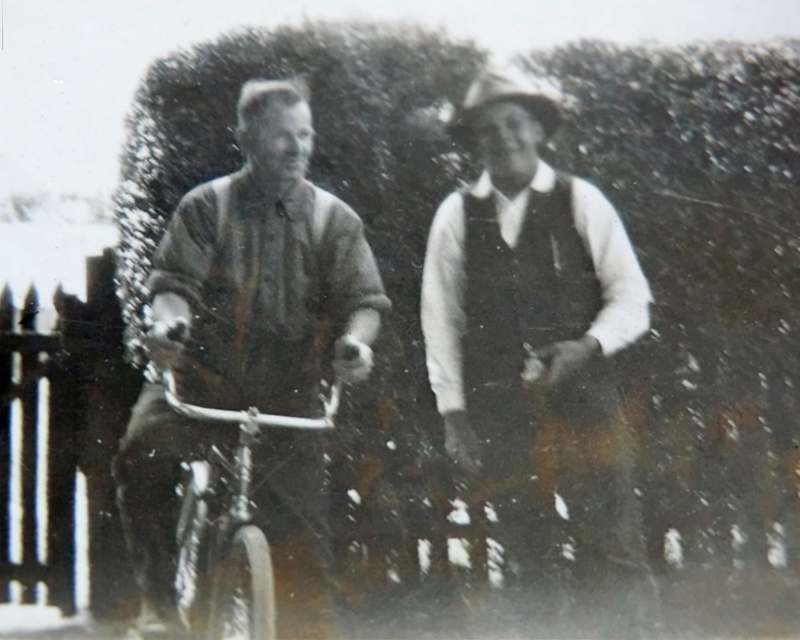 Andy Duncan (left) with nephew Clarrie Stewart c.1932. The upturned handlebars on the bicycle allowed Andy to cycle with the minimum discomfort from the shrapnel in his back. From the author’s collection. Copyright Andrew Palmer. Jane was able to find work doing laundry for the Beggs family of Eurambeen homestead. Laundry was delivered to the Stewart house once a week. Jane would do the washing by hand in a big copper pot and mangle behind the house. Six rows of washing stretched the entire width of the block. Once the washing was pegged to the line, Jane would insert y-shaped gumtree branches at intervals to lift the line up and keep the clothes off the ground (Blog site A Rebel Hand has a wonderful photo of this kind of wash day). Jane’s mother died in November 1934, leaving Jane to run the house and stretch the family budget. Andy re-established his civic and social interests in Beaufort. He joined the local branch of the Returned Soldiers’ League and became a committee member, representing the men of the town. He became the secretary-librarian of the Beaufort Mechanics’ Institute, and Jane helped with the upkeep of the Mechanics’ Institute hall. In January 1938 the newspaper announced At the annual meeting of the Beaufort Cemetery Trust, the resignation of Mr. A. Parker as secretary after 30 years of service was received with regret. Andy was appointed to the position, with an annual payment of £20. The money would not go far when the average wage was around £3 a week, but it would help make ends meet. Then in June 1939 the same Mr. A. Parker resigned as Registrar of Births and Deaths. Andy was first acting Registrar, then appointed to the position. Jane’s father John Stewart and Andy built an office for Andy’s Registrar duties on the front verandah of the Stewart’s cottage. They cut the logs and split the wood to make the weatherboard sidings. Considering that John Stewart was in his 90s at the time, he must have been in robust health. Perhaps John Stewart also helped Andy build the shed behind the house. It was a very simple construction: four tree trunks rammed into the ground to form the corners of the shed, then corrugated tin sheeting for the walls and roof. Here Andy kept a trunk with his Anzac memorabilia. Featured image: The Stewart family home, Beaufort, 2015. Andy’s Registrar’s office was where the verandah table sits. From the author’s collection. Copyright Andrew Palmer.